The FCC wants to destroy net neutrality and give big cable companies control over what we see and do online. If they get their way, they’ll allow widespread throttling, blocking, censorship, and extra fees. On July 12th, the Internet will come together to stop them. Below is a list of notable websites, companies, and organizations who have confirmed their participation in the July 12th day of action. The list is broad, and represents a wide range of perspectives and online communities. The one thing all of them agree on: defending Title II net neutrality. The Internet has thrived precisely because of net neutrality. It's what makes it so vibrant and innovative—a place for creativity, free expression, and exchange of ideas. Without net neutrality, the Internet will become more like Cable TV, where the content you see is what your provider puts in front of you. What will happen on July 12th? Websites, Internet users, and online communities will come together to sound the alarm about the FCC’s attack on net neutrality. We'll provide tools for everyone to make it super easy for your followers / visitors to take action. From the SOPA blackout to the Internet Slowdown, we've shown time and time again that when the Internet comes together, we can stop censorship and corruption. Now, we have to do it again! And don't worry, none of these will actually block, slow, or paywall your site. But, they will let your users submit a comment to the FCC and Congress without having to leave your platform. They will only show up once and users can click away. Feel free to use these alerts, or create a unique message that makes sense for your site. For example, if you primarily host video, put the spinning wheel of death on every video with a link to battleforthenet.com so your users can submit a comment to the FCC and Congress. Do you run a site or blog? 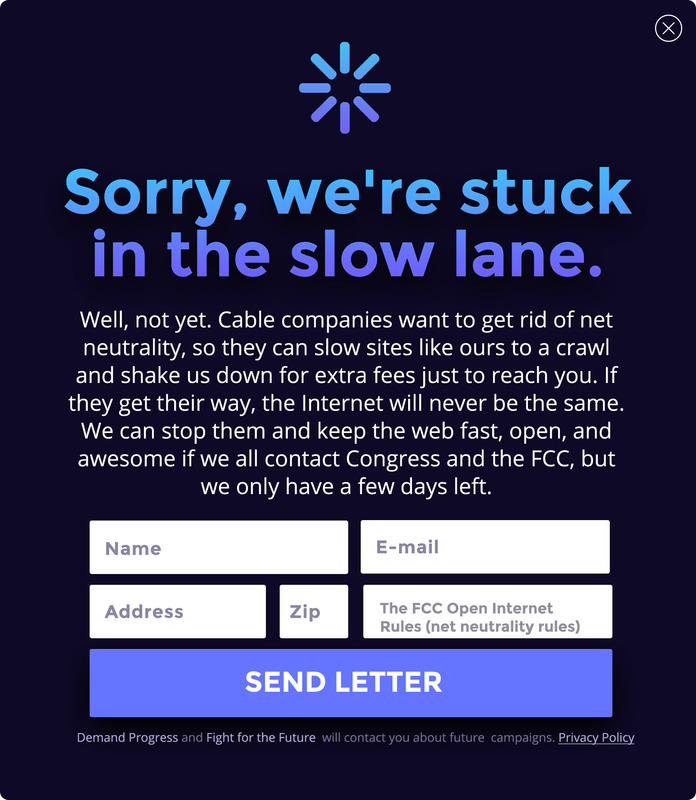 Use these banner ads to get the word out on net neutrality. There are tons of ad sizes to choose from here. Are you a social media user? Here is some suggested copy you use to spread the word. And be sure to share these awesome graphics to get the word out. You can see a huge folder of them here. Or change your avatar to a dreaded loading sign below. And be sure to share these images on Facebook and Twitter. We're just getting started with organizing this massive day of action, so sign up and we’ll get in touch soon with more information. If you have ideas or want to help, let us know. If you run a high-traffic website, startup, or small business, get in touch. We need you! We made a short video reel that explains why net neutrality matters, and how Internet users can tell the FCC and Congress to protect the open web at all costs through BattleForTheNet.com. Add this reel to your online creations on or before July 12. Tell your viewers about the day of action on YouTube, Vimeo, or wherever else you host content! And you don't have to wait until the day of action to drive traffic to Battle for the Net. If you’re ready to start now, go for it! And we'll need to keep pushing after July 12 too, so don't stop then! 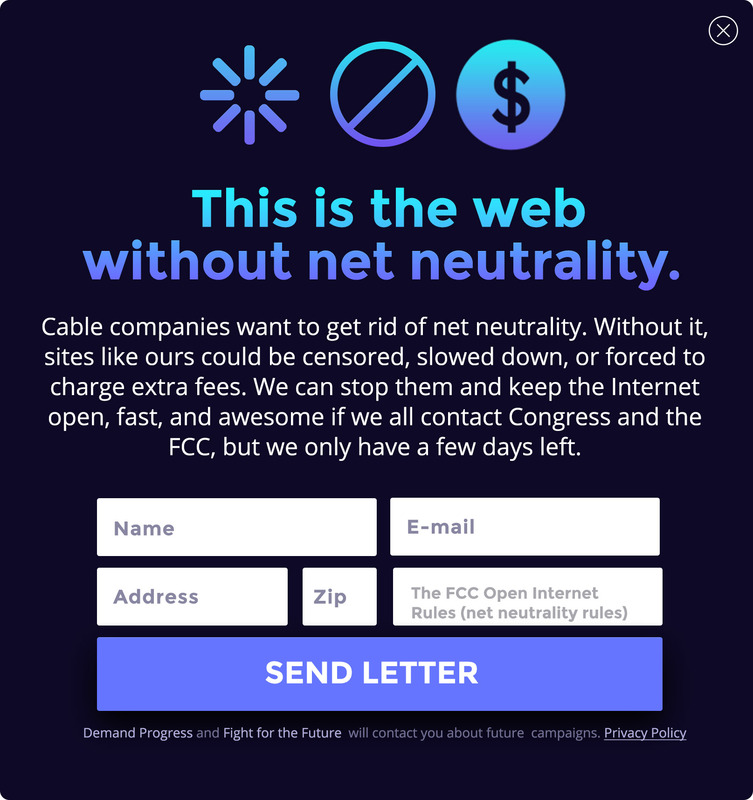 Discord – An in-app message asking gamers to speak out at battleforthenet.com, social media sharing, and activating their HypeSquad for the big day! 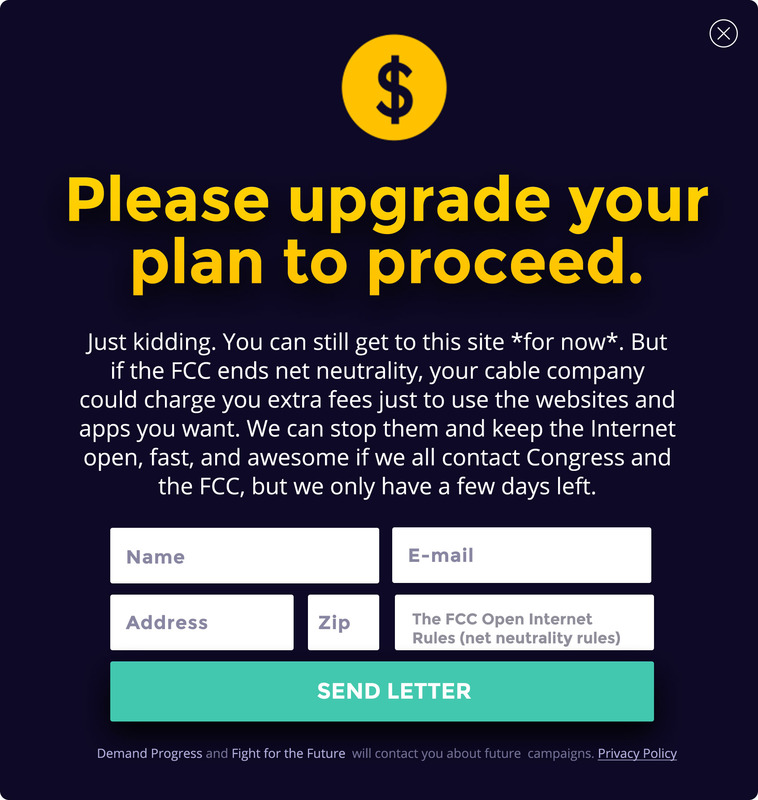 Medium – Prounounced alert and blog about why net neutrality matters. OkCupid – In-app message to all users asking them to speak out through battleforthenet.com. Sonic – Adding a site-wide alert, and promoting battleforthenet.com through their blog, email, and social media channels. Vimeo – Net neutrality explainer video and graphics optimized for every social media channel. 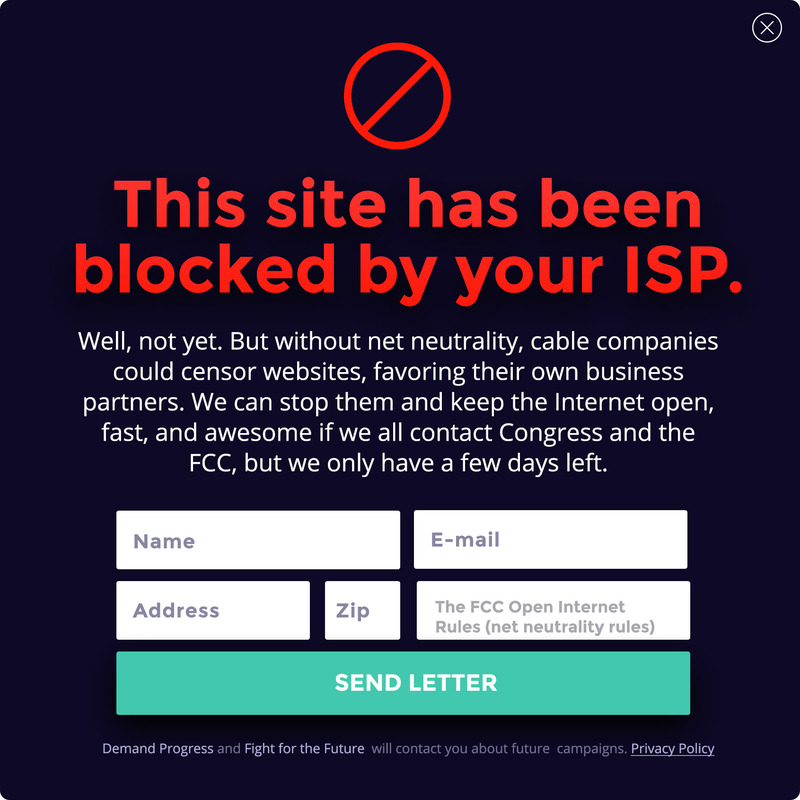 Plays.TV – A site-wide alert GIF asking gamers to contact the FCC and Congress through battleforthenet.com. Press inquiries email press@fightforthefuture.org or call 508-474-5248. Press inquiries email press@demandprogress.org or call 202-681-7582.